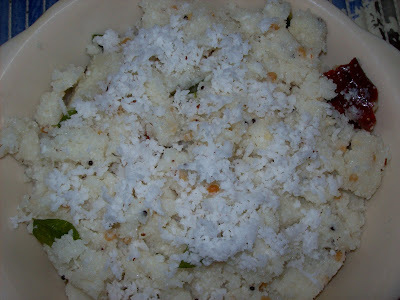 Washed rice, spread on a towel to dry.Cup of washed, dried rice blended to make a coarse "rava". 1. Wash the rice well in several changes of water until the water runs clear. 2. Spread it out to dry on a clean towel or dish cloth for a few hours or even overnight. 3. Coarsely powder the rice in a blender or food processor. Work in batches till the rice resembles bread crumbs. 4. Heat 1 tsp oil in a pan. When it is hot, add the asafoetida and mustard seeds. 5. When the mustard seeds pop, add the dried salt-cured chillies. 6. They turn a dark golden brown, add the green chillies and curry leaves. 8. When the water comes to a boil, add the salt and shredded coconut. 9. Add the rice rava and stir well to mix. 10. 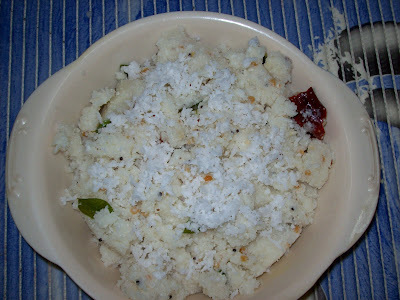 Cover and steam like for "upma" till the rice is cooked. 11. It may still taste a bit raw at this point, but will be fine when it is steamed again. 12. When the mixture is cool, form into small balls. 13. 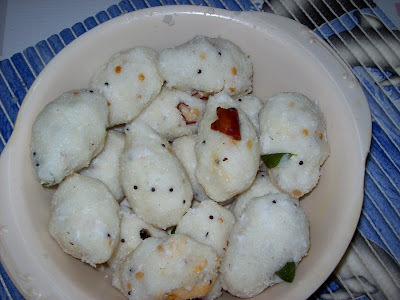 Put the balls in a greased idli plate or even the steamer of a rice cooker and steam for 10 minutes. 14. Balls will subtly change in color and texture and get a glossy shine. That indicates that they are well cooked. 15. Serve hot with kothsu ,chutney, dosa chutney podi, or sambhar.